I came to KUNSTGUT to experience what it would be like to dedicate to the process of art-making and possibly continue into a carreer as a working artist. I want to develop a body of work, and so I have come to Berlin for a one-year program of study at KUNSTGUT: I did study art at Bard College in New York, through after one year went into another field and carreer. Now, more than ten years later, I have come back to the idea and I am very glad that I choose to study at KUNSTGUT. It has been agreat fit for me. 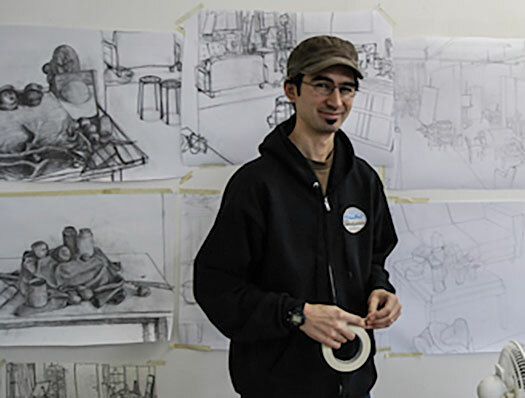 At KUNSTGUT I have experienced a supportive environment to develop artistically: With the insightful guidance of Frank, the wonderful community of students, and a lot of time working in the studio.